For the first time HRH The Duchess of Cambridge has co-designed a garden for the Royal Horticultural Society (RHS) at the world famous RHS Chelsea Flower Show (21st to 25th May, 2019). The RHS Back to Nature Garden has been designed by The Duchess of Cambridge and award-winning landscape architects Andree Davies and Adam White of Davies White Landscape Architects. The garden has been inspired by childhood memories that are triggered by the natural world as well as special moments that will be created and treasured by families now and in the future. It is a woodland setting for families and communities and encourages all generations, from all backgrounds, to connect with nature and enjoy growing plants for their own health and wellbeing. The RHS Back to Nature Garden is key to the RHS’s partnership with NHS England, promoting the physical and emotional well-being that access to green spaces and gardening provides. After the Chelsea Flower Show, much of the planting and some of the landscaping will go to a NHS Mental Health Trust as part of a national competition run by the RHS. 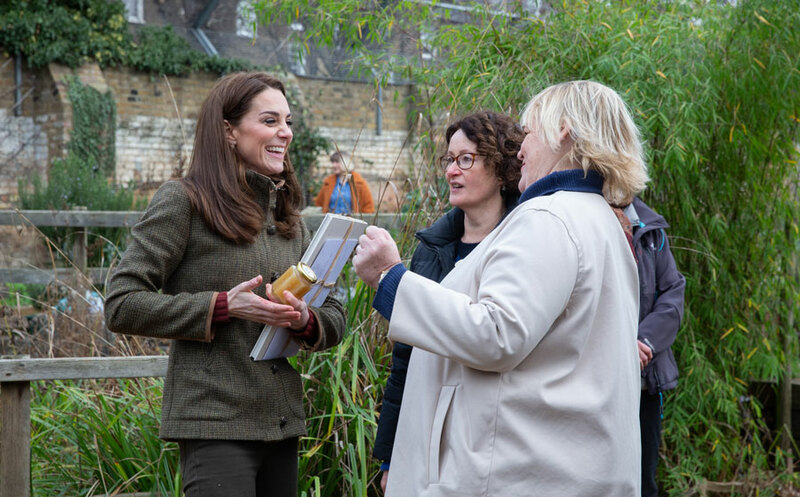 The news was announced ahead of a visit by The Duchess to King Henry’s Walk Garden in Islington, an RHS It’s Your Neighbourhood group – part of the Britain in Bloom campaign, in early January, 2019. RHS Director General, Sue Biggs said they could not be more thrilled or feel more honoured that The Duchess of Cambridge is to co-design the RHS Garden at Chelsea: “For over 200 years the RHS has been championing the power of gardening and growing plants for the environment, for health and wellbeing and to help people of all ages, from all backgrounds, to learn and grow. So to have The Duchess advocating this with us, and to be continuing our partnership with NHS England will, we’re sure, further highlight the powerful benefit that access to gardens, nature and growing plants can have for all our health and happiness,” Sue said. In addition, The Duchess of Cambridge and Davies White will be co-designing two further RHS Gardens, maintaining many of the elements from the Chelsea garden at RHS Hampton Court Palace Garden Festival (2nd to 7th July 2019) and RHS Garden Wisley, which will open in the Autumn later this year. Picture credit: strictly ©RHS – banner: HRH The Duchess of Cambridge chats with RHS Director General Sue Biggs and community gardener Nicola Freshwater at RHS It’s Your Neighbourhood group King Henry’s Walk Garden, Islington and Community Gardener Nicola Freshwater.